In Chap. 3 we examined the discrimination of two unknown quantum states. This chapter will consider the estimation of a parameter θ, which labels an unknown state parameterized by a continuous variable θ. It is a remarkable property of quantum mechanics that a measurement inevitably leads to the state demolition. Therefore, when one performs a measurement for state estimation, it is necessary to choose the measurement that extracts as much information as possible. This problem is called quantum estimation, and the optimization of the measurement is an important topic in quantum information theory. In the classical theory of estimation (of probability distributions) discussed in Sect. 2.3, we saw that the estimation is intimately related to geometrical structures such as the inner product. We can expect that such geometrical structures will also play an important role in the quantum case. 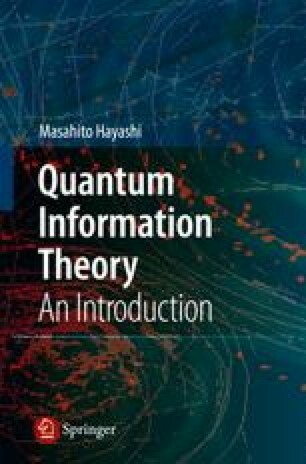 The study of geometrical structures in the space of quantum states is called quantum information geometry and is an important field in quantum information theory. This chapter will examine the geometrical structure of quantum systems and discuss its applications to estimation theory.